ON Sunday March 21 next when Srinivasaraghavan Venkataraghavan, known throughout the cricketing world as Venkat, walks off the Sri Lankan cricket stadium at Kandy after supervising the second Test between Australia and Sri Lanka, he will end a nearly 40-year-old association with cricket not only as an umpire but also as a highly rated player, a coach, a cricket administrator and a national selector. Venkat, in fact, is an institution by himself. He is the only umpire in the International Cricket Council’s elite panel who has played at every level of the game—first class, Test as well as one-day internationals. While coming to international cricket, he made sure that he had earned his engineering degree to fall back on if a career in cricket did not work out. He will be missed in International cricket, if for nothing else but for his measured judgements while supervising matches. Though a very strict, but fair, umpire on the field, he was never unwilling to tell a bowler why his appeal was being turned down, a rare quality for an international umpire. Having played at every level, he surely knows the frustration of a bowler when he thinks a genuine appeal is being rejected by the umpire. The international playing career of Venkat began from February 1965, when he made his highly-successful debut against New Zealand in a home series, and lasted till September 1983 when he toured the West Indies, one of the longest for an Indian cricketer. He also led India in five Tests, including four on the 1979 tour of England. He also played in 15 one-day internationals and led India in the first two World Cups, both in England. He finally retired from first class cricket in 1985 after taking the second biggest haul of wickets in Ranji Trophy (530) behind Haryana’s Rajinder Goel, who unfortunately could never don India colours, before he took on the job of umpiring which he did with equal dexterity. 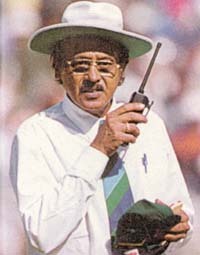 Venkat made his international umpiring debut in India’s 1992-93 home series against England and will have umpired 75 tests and 52 one-day internationals by the time he finally bows out. Prior to that, he played in 57 Tests and 15 one-dayers. He was a member of India’s famous spin quartet of Bishan Singh Bedi, Erapalli Prasanna and Bhagwat Chandrasekhar. In fact, India’s richness in the spin bowling department that year saw Venkat cooling his heels in a number of Test matches since the team could, more often that not, play only three spinners and the above three got the nod ahead of Venkat. But he did prove his worth whenever given an opportunity. Unlike his three contemporaries, he was an excellent fielder, especially in areas near the wicket, a quality which the other three spinners did not possess. Not yet out of his teens when he made his Test debut, Venkat claimed as many as 21 wickets in four Tests against New Zealand in that debut series, including a match haul of 12 wickets in the last game at the Ferozeshah Kotla in Delhi. The presence of the other spinners in the Indian team prevented him from grabbing the headlines but his performance at Port of Spain in 1971, when he took five for 95 to star in India’s first win against the West Indies in the Caribbean, was the highlight of career which could have seen Venkat doing much more than he actually did. But his performance as an international umpire got him the respect of all cricket playing countries as also top functionaries of the ICC. Over the years,Venkat did inspire a number of former Indian Test cricketers to take to umpiring, for example Yash Pal Sharma, since he was of the belief that one who has had played under such pressure-cooker situations generated in international matches could judge the best. He is finally planning to say goodbye to the elite panel of the ICC. It does not mean that one has heard the last of Venkat because he is one person who is ever willing to give back to the game all that he has got over the years.